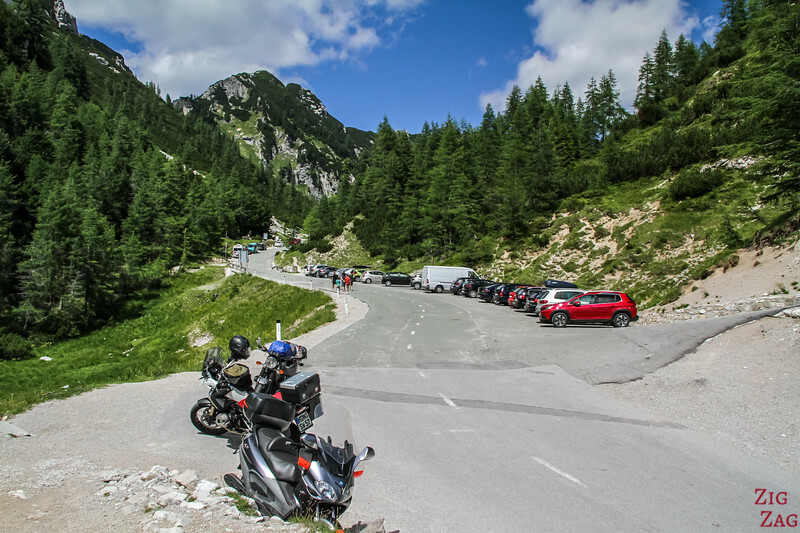 Discover one of the most beautiful roads in Slovenia: the VRSIC Pass drive and its gateway, the magnificent Lake Jasna. 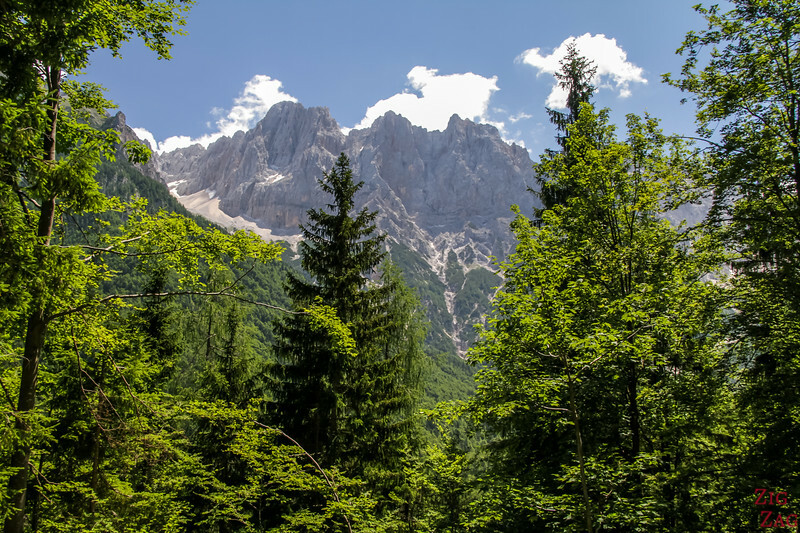 With mountainous landscapes of the Julian Alps and emerald water, you will not mind the 50 sharp bends since the scenery is breathtaking all the way. 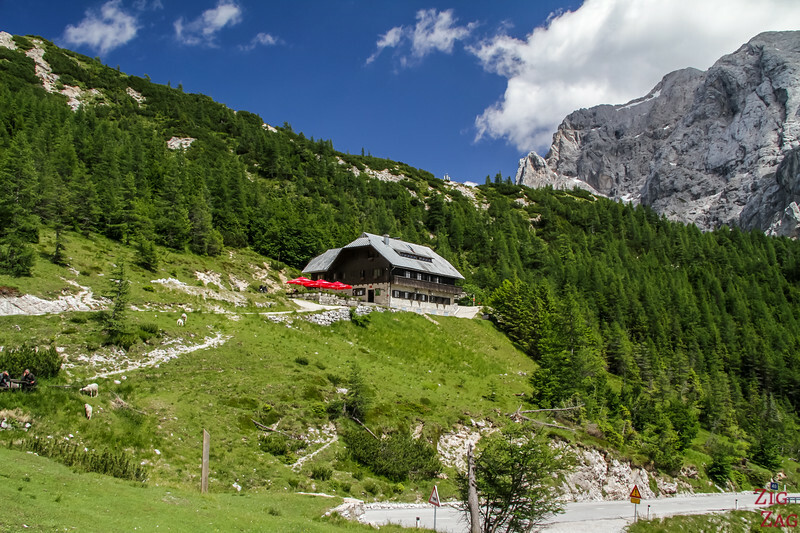 Let's start with a short video showing you the fabulous landscapes of Lake Jasna and sections of the drive through the VRSIC mountain pass. 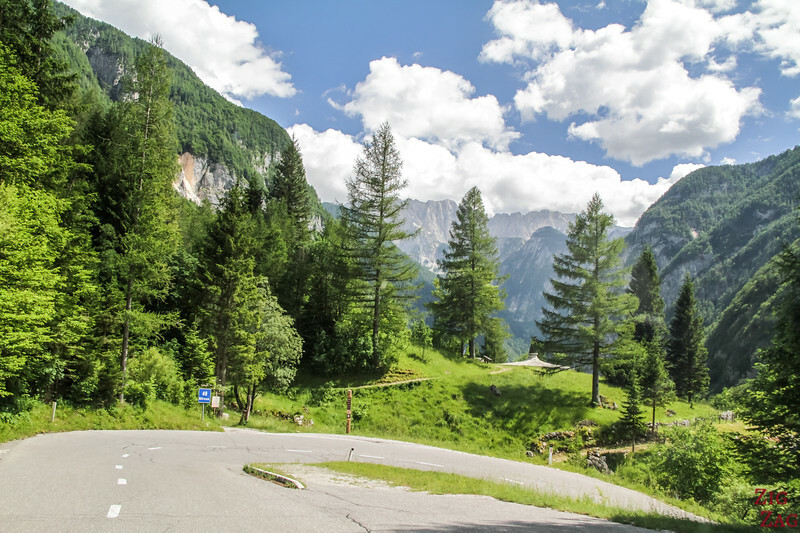 I did not film the road much while driving up, but you can see some of the turns as I go down towards the Soca Valley. 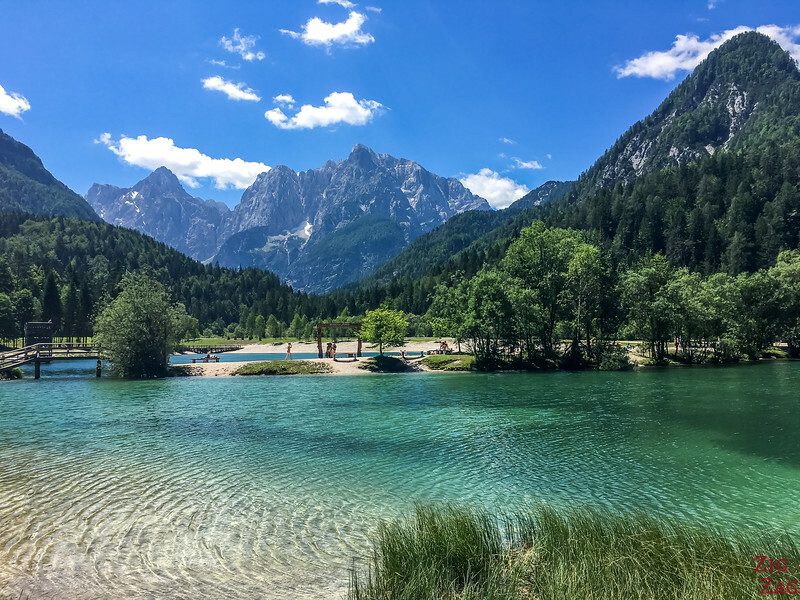 First stop on our Road trip through the Julian Alps: The Jasna Lake, one of the most beautiful panoramas in Slovenia. The color of the water is unbelievable, I promise you it looks like that. 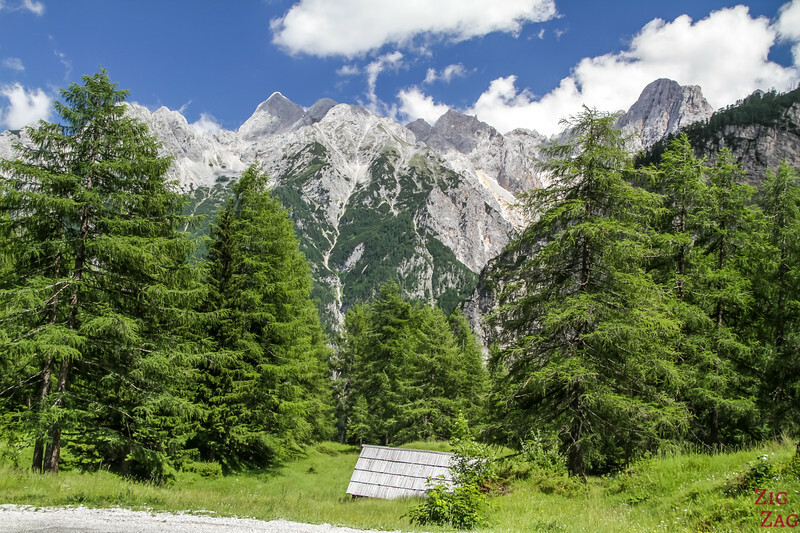 Plus you have green tree covered mountains all around, and the highest bare peaks of the Julian Alps in the background. 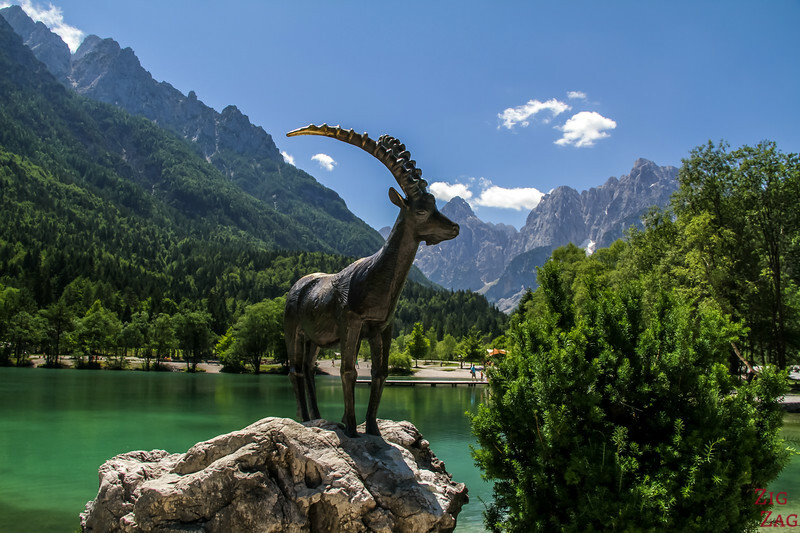 The lake is garded by a Bronze statue of an Ibex called Zlatorog (GoldHorn), a legendary animals in many Slovenia stories about Mount Triglav, the highest point in Slovenia (you can read the legend here). 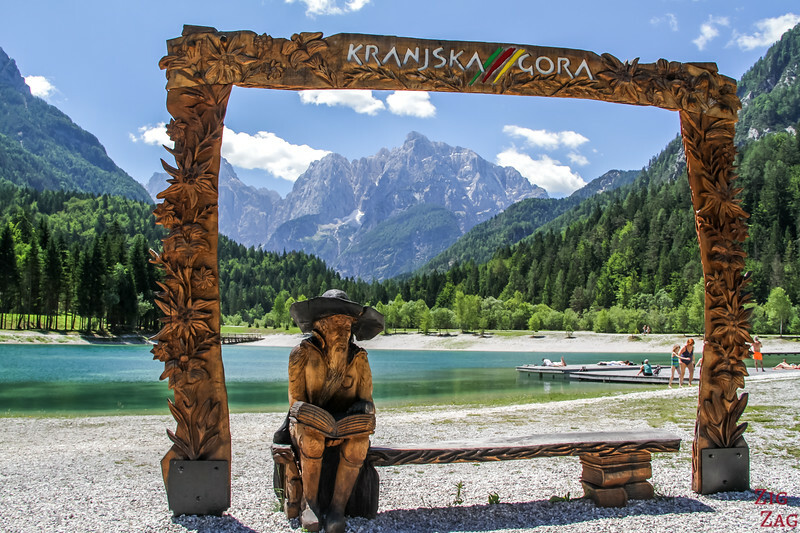 Lake Jasna is actually made of 2 artificial lakes just 2km away from Kranjska Gora. They are formed with the water of 2 branches of the Pisnica stream. 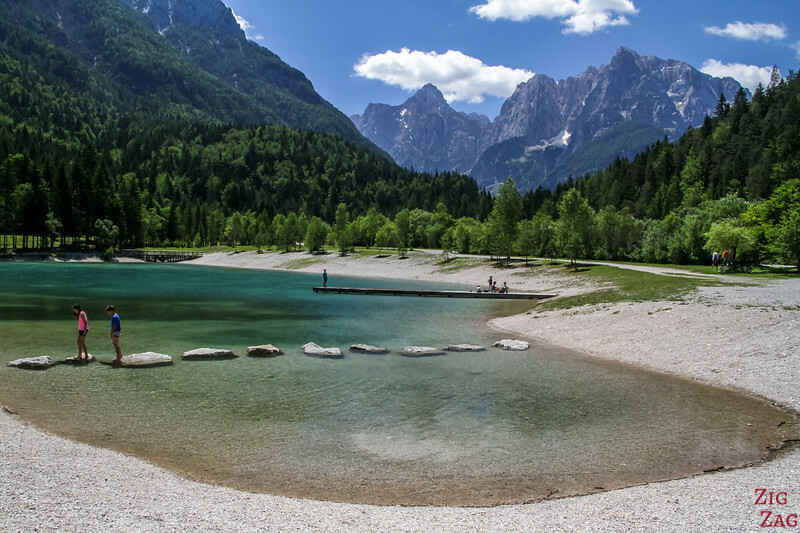 Jasna Lake is at 2723ft of elevation (830m). They have set up a beach and a café /bar to relax by the water. You can go for a swim in one of the lakes (there is even a 3 level diving platform int he middle). Or you could fly fish in the other lake. It is so beautiful, I now wish I had spend the night here to see it with the changing light and weather. If you want feel tempted too, check out this accommodations close to the lake. Before I share pictures of the main stops along the VRSIC drive, let me tell you about the quality of the road. 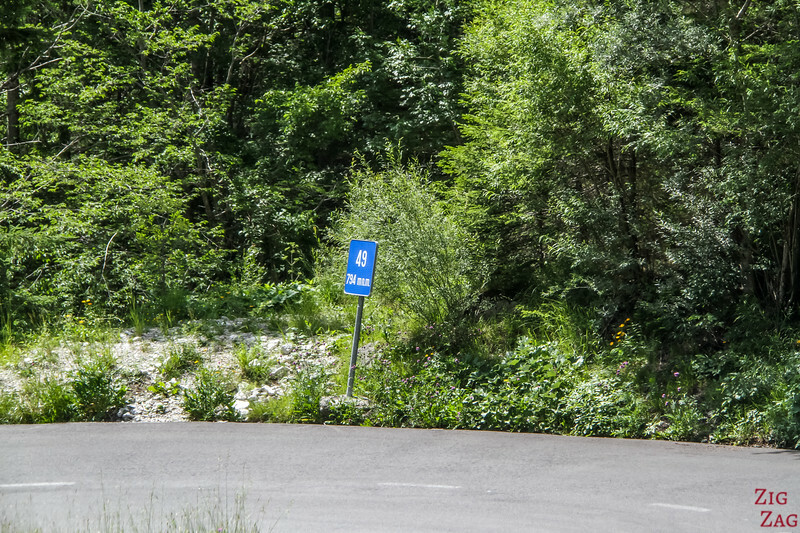 Is the VRSIC road a difficult drive? Is it dangerous? 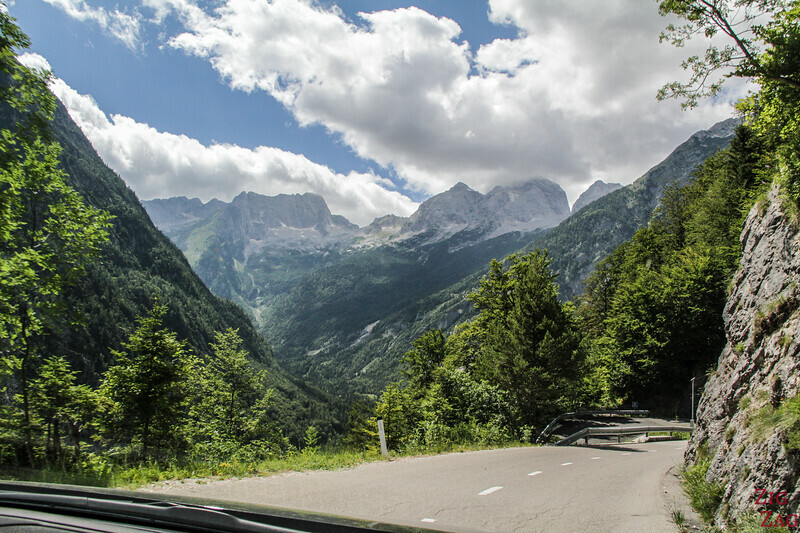 See in the photos above and below, the turns are numbered coming from Lake Jasna and driving towards the Soca Valley. At each turn the road is switching from smooth tar to cobbles to that you don't fall asleep and turn. The side of the road is often blocked by either wood ramps, metal ramps or like below rock square blocks. 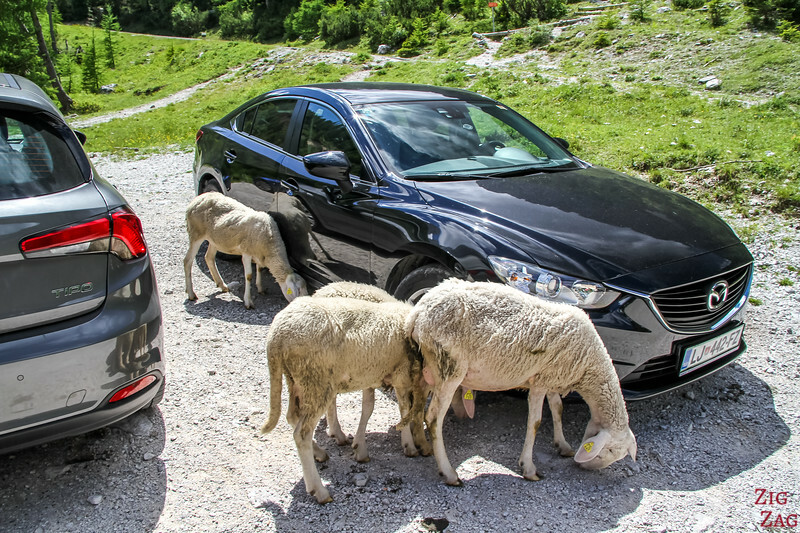 Just be careful with the animals on the road and don't hesitate to stop to eat something on your way! And here we go with turn 49. It was not that bad, even for me who is very stressed on mountain roads! The road is generally in good condition. If you see cars stopped. Wait in the queue. It means that they are doing some roadwork and traffic is alternating. Be patient, they have a tendency to set up very long traffic lights. 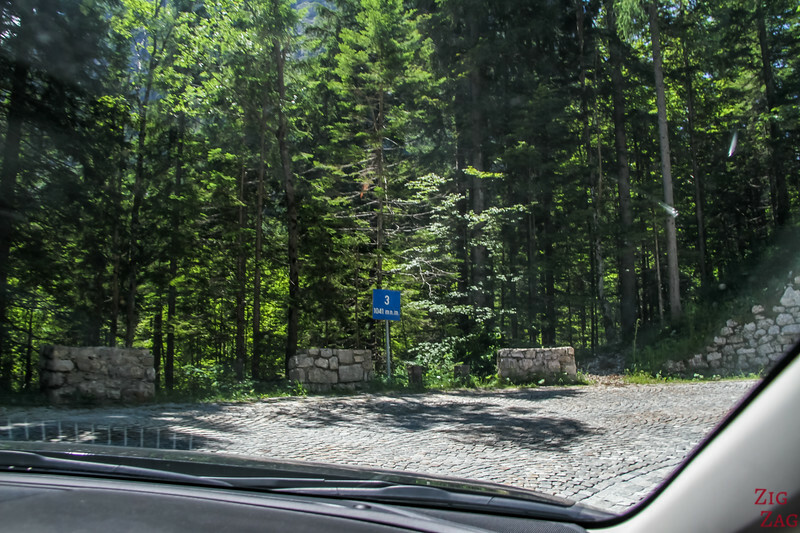 Vrsic pass history - The VRSIC Road, which connects Krankja Gora to Bovec is also known as Ruska Cesta (the Russian Road) as it was built by Russian war prisoners during the 1st world war. 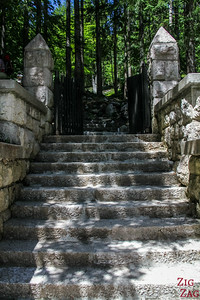 First stop on the Vršič pass drive: the Russian Chapel. 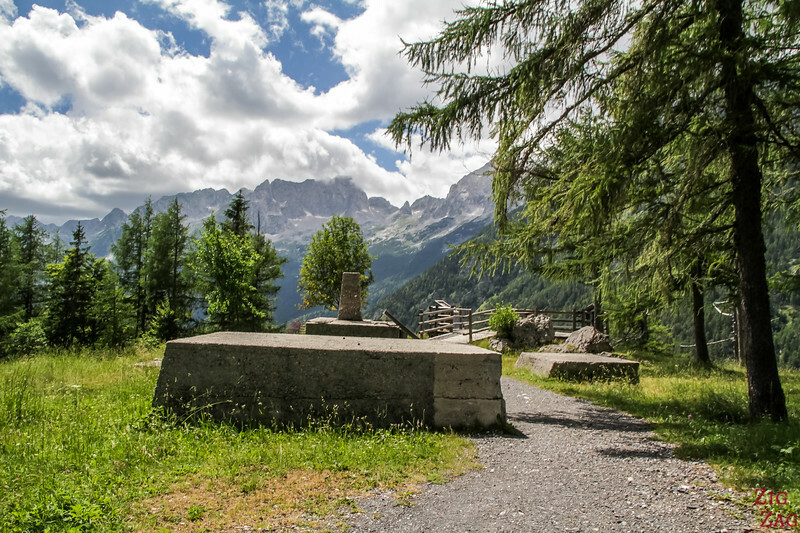 During the 1st WW Kranjska Gora was an important crossroad for the military.Italy and Austria were at war and the Soca rive front line was very strategic.in 1915 and 1916, the Austrian used over 10,000 Russian prisoners to build this road. In March 1916, an avalanche killed more than 100 of them. 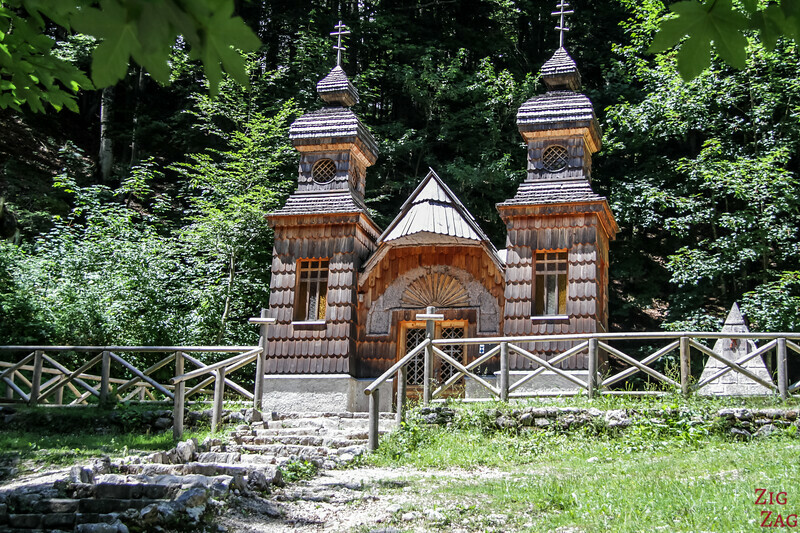 In 1917, the surviving prisoners built this Russian chapel in memory of their fellow soldiers. Near Bend 8, a parking is clearly indicated on the side of the road after the access point. Climb the few stairs to discover the wooden structure. Then you arrive at a viewpoint with many explanation about the region. 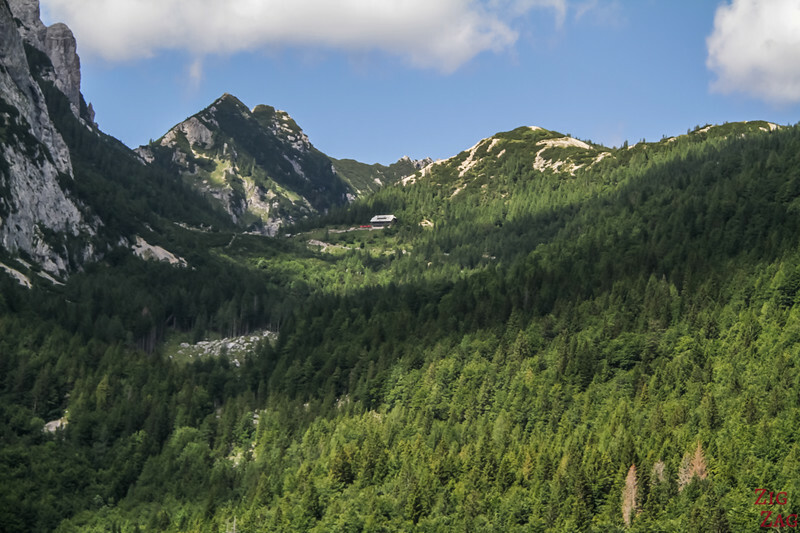 It is facing a large block of mountain rock Prisank which reaches 2547m. It is a colossal mountain front oriented towards the North East. ​The sign provide information on the region. They help you find features in the mountain. For example, in the photo above, can you see to the top right, there is a small hole. It is called front window (Prednje okno) and is 80m heigh and 40m wide. 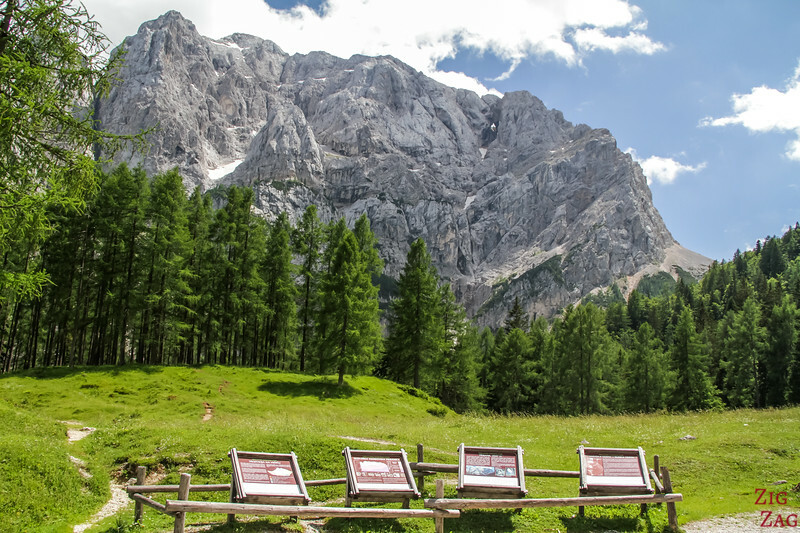 It is the largest natural window in the Julian Alps. And in the photo below, can you find the "Pagan girl" (ajdovska deklica). Rocks have fallen and people are seeing a face. Can you see it below the snow? One of my favorite stop was just a bit further away. There is a large parking and a path going up to a small cafe. I took the pass at the back of the parking to get closer to the bare mountains. 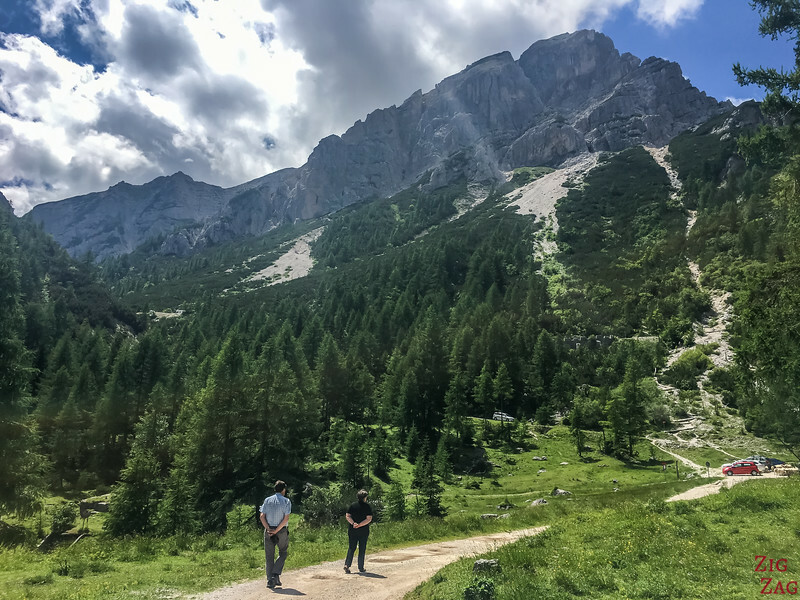 I really enjoyed this stop because of the different shades of green and the perspective with the mountains.​ Plus we were almost alone to enjoy it compared to the top at the VRSIC pass itself. We did not have to walk for long to get that amazing view. What do you think? Feels almost like we touch them! And this is the view on the way back to the parking. And after 24 turns and some fantastic view, we finally reach the mountain pass of VRSIC itself. 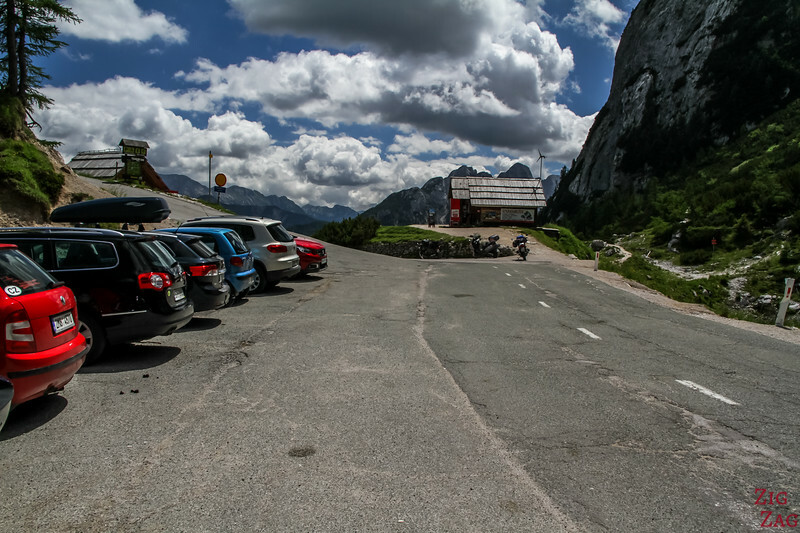 There is a large parking at the pass. 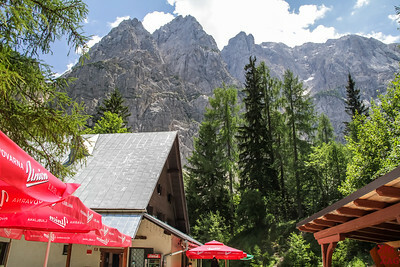 There is also a restaurant a big higher from the parking with a great view. I must admit that I preferred the views on the way up and the next view on the way down rather that this one at the top... But it is an easy break in the middle of the road for the driver! 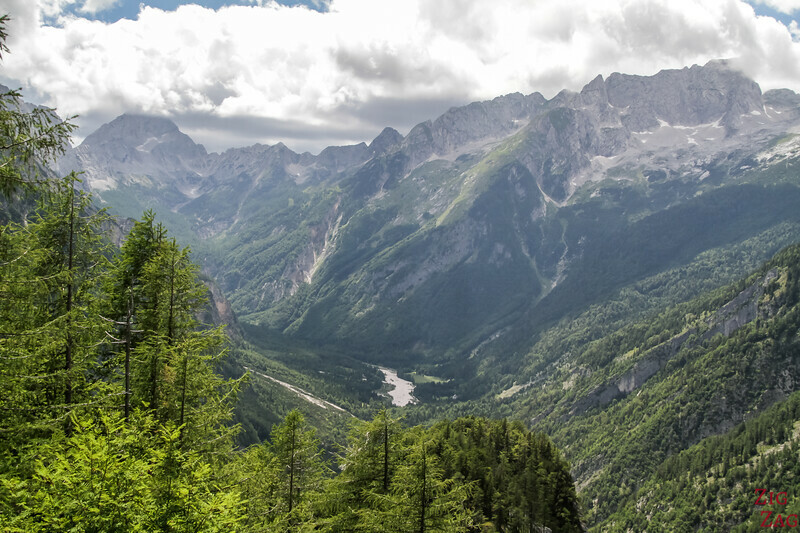 ONn the way down towards the magnificent Soca river and the town of Bovec, there is one more stop: the Supca viewpoint. A platform has been set up to enjoy the magnificent view. This stop also has some historical artefacts and set up from the First World war especially a supply telpher line. The concrete blocks are remains of the telpher. It played a very important role in the delivery of military supplies. But if llike me, you are not an history buff, move forward and enjoy the spectacular view over the deeply cut glacial valley. Turn around and see the restaurant ? 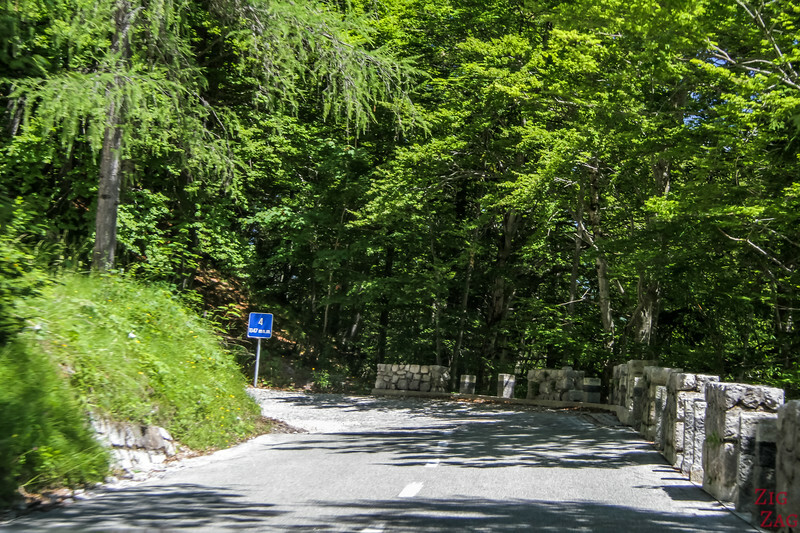 This is where the Vršič pass is. And then you can finish driving down in enchanting scenery. Too bad for the driver who has to focus on the road and can't enjoy those views! 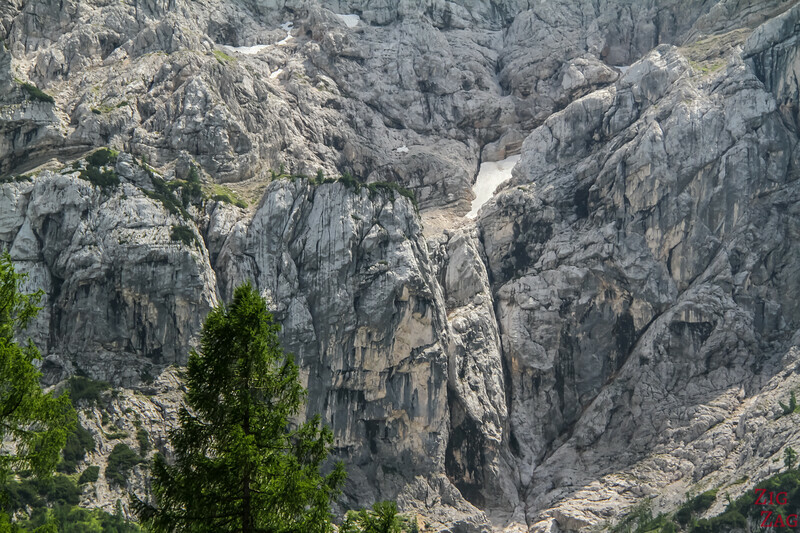 Of course the Julian Alps drive does not stop there. 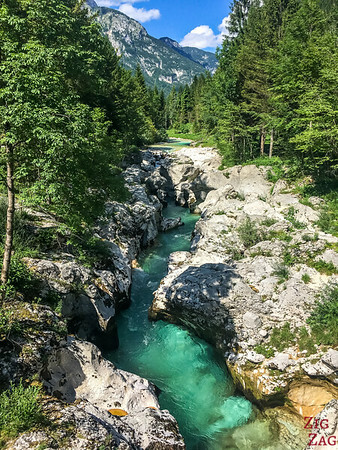 Now you enter the world of the Soca Valley and its emerald river. 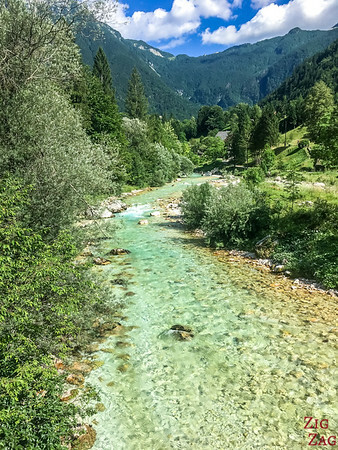 So many places to stop to enjoy the narrow valley on the way to Bovec. Here is a tease of what there is to come! 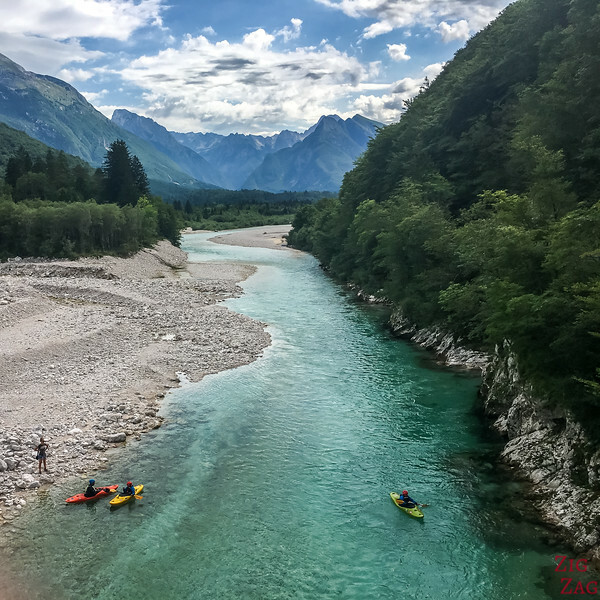 And you can check out my article about the Soca Valley Slovenia for many more pictures. 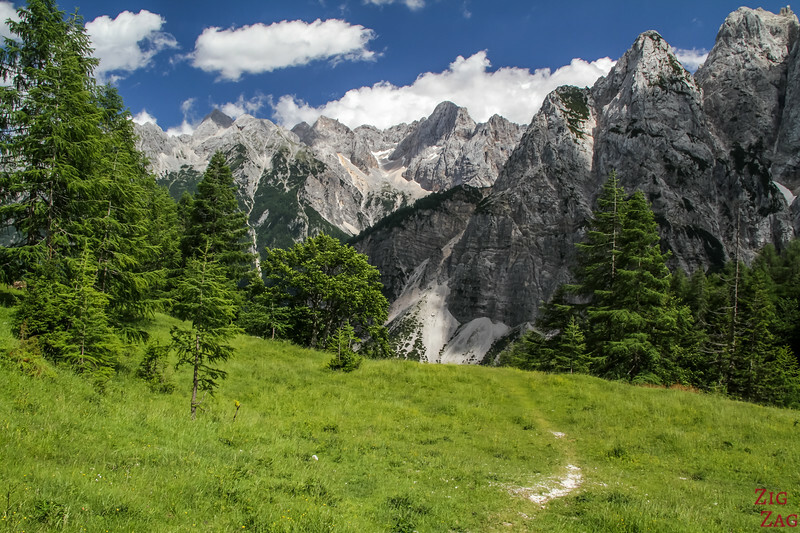 Some of the best places to see in Slovenia. 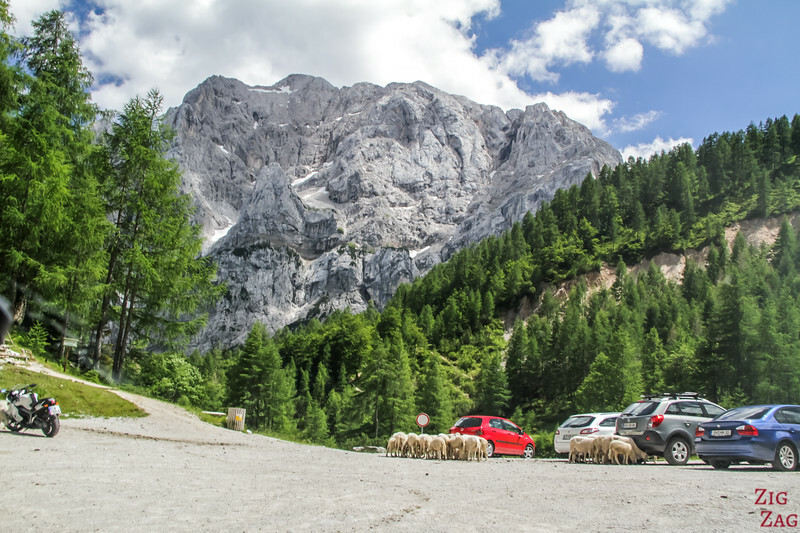 Bovec can be reached via another easier road through Austria if you don't want to drive this mountain road. 45min drive without stopping from Kranjska Gora to the Soca Village. It is not a difficult drive, however because some of the bends are really sharp, it is not recommended with a caravan in tow. 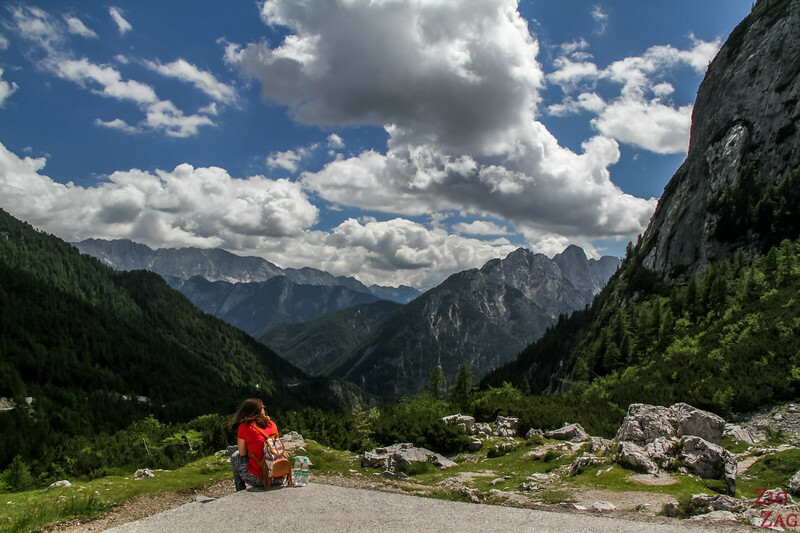 All this views, along with many other beautiful places, are included in my eBook: The Road Trip Guide-Slovenia. 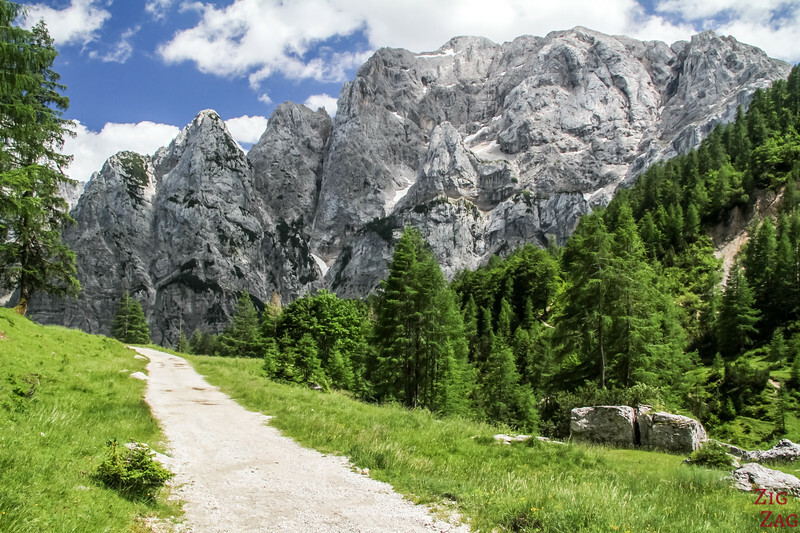 What is the most scenic direction to drive the Julian Alps loop?